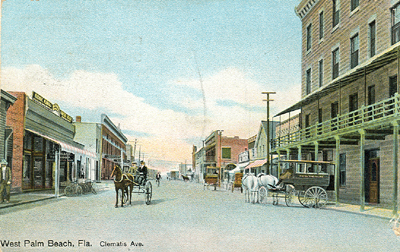 The area now encompassed by the City of West Palm Beach was first homesteaded in 1873 and was a sleepy frontier outpost during its first two decades of existence. On April 2, 1895, Henry Flagler’s Florida East Coast Railway began regular rail service to West Palm Beach and the city entered its first period of substantial growth. 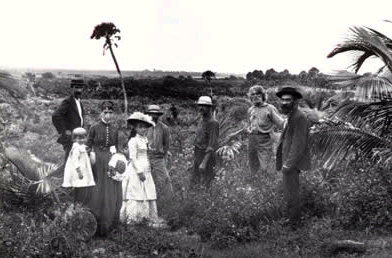 is believed to be the site of present-day West Palm Beach. Early economic activity was centered around tourists drawn to the area’s lovely beaches and climate, particularly those visiting the Royal Poinciana and Breakers hotels on the island of Palm Beach. Over the next decades the city experienced cyclical land booms and busts which had the cumulative effective of increasing the city’s population and the demand for single family homes. By 1920, the city boasted 8,669 residents and total property value of $12.6 million in 1920 dollars. Clematis Street, downtown West Palm Beach. 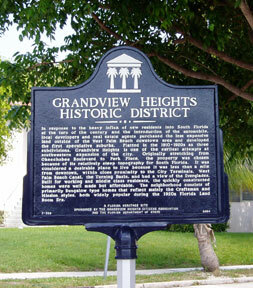 The Grandview Heights neighborhood was established in 1910 and is first residents were ministers, downtown shopkeepers and the craftsmen who built the luxury hotels of Palm Beach. Most historic homes in the neighborhood were completed by 1925. By 1929, total property values in the city reached $89 million, despite the fact that South Florida experienced major hurricanes in 1926 and 1928. By 1930 however, West Palm Beach was in the throes of a land bust in which the speculative buyers who had driven land prices upward abandoned the market and were often personally bankrupted. The cycle of growth and contraction would be a continuing motif in the development of the Grandview Heights neighborhood. By the 1980s, the neighborhood was a textbook case of urban decline, with high crime rates and few property owners interested in maintaining or restoring their historic homes. Rampant drug dealing and prostitution made the neighborhood unsafe and unattractive. In 1989, the City of West Palm Beach acquired approximately half of the properties in the neighborhood and demolished the homes to make way for a planned downtown redevelopment project. Ten years later the city’s project was finally completed; today the buildings that were made possible by the city’s eminent domain action have become significant community institutions: the Kravis Center for the Performing Arts, CityPlace and the Palm Beach County Convention Center. The 1990s also saw a resurgence of interest in urban living – a trend noticeable in many cities around the country but especially critical in coastal Florida municipalities, which had experienced major depopulation in connection with the rise of suburban developments. Today Grandview Heights is a fine example of community revitalization, with a diverse group of dedicated homeowners who are active community participants. The neighborhood works closely with the City of West Palm Beach, the police department, the parks department and many other nonprofit organizations to continue improving the quality of life for Grandview residents.